My visit to the French countryside changed my life. Nearly every home is enveloped in an elegant and perfectly pruned rose garden. And if there is no garden, pots and planters filled to the brim with a breathtaking array of flora sufficiently fill the gap. 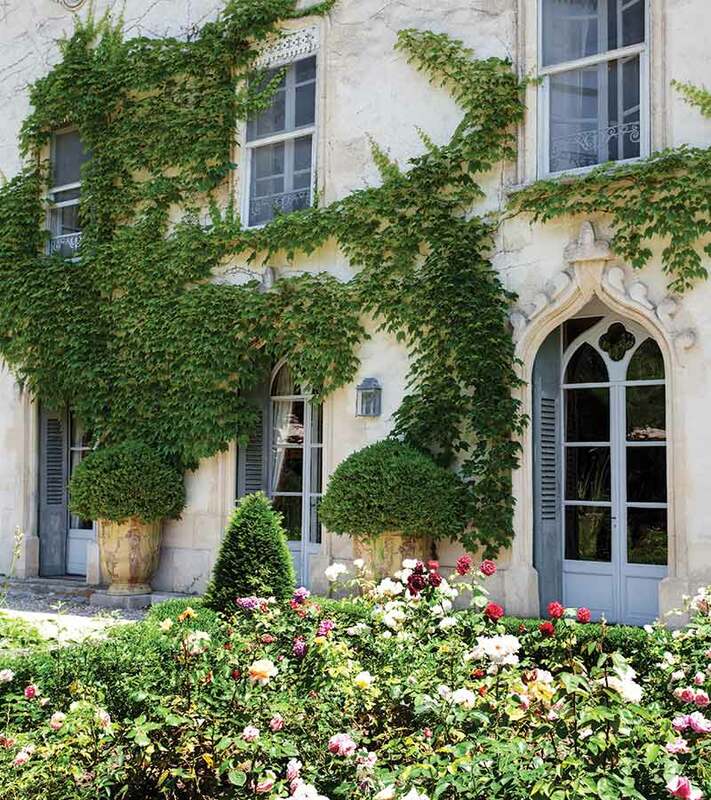 From luxurious castles, quaint farmhouses and charming villas, each kind of French home is enchanting in its own way. There is a fairy tale-like quality to every abode—I could truly get lost for hours simply strolling around gazing affectionately at each home. The exteriors are spectacular, but the interiors boast a glorious mixture of textiles in plaids, toiles, and floral prints that I cannot seem to get enough of! And, my, oh my, at the darling little shops brimming with stacks and stacks of the plushest threads I have ever felt. Fabric remnants, quilts and blankets, place mats and tablecloths—be still my linen-loving heart! Timeless is the best word to describe French style. Nothing is discarded, but rather carefully repurposed. Old farm tables find their way into the kitchens and office spaces. Mismatched chairs gather around counters and desks to add such personality. 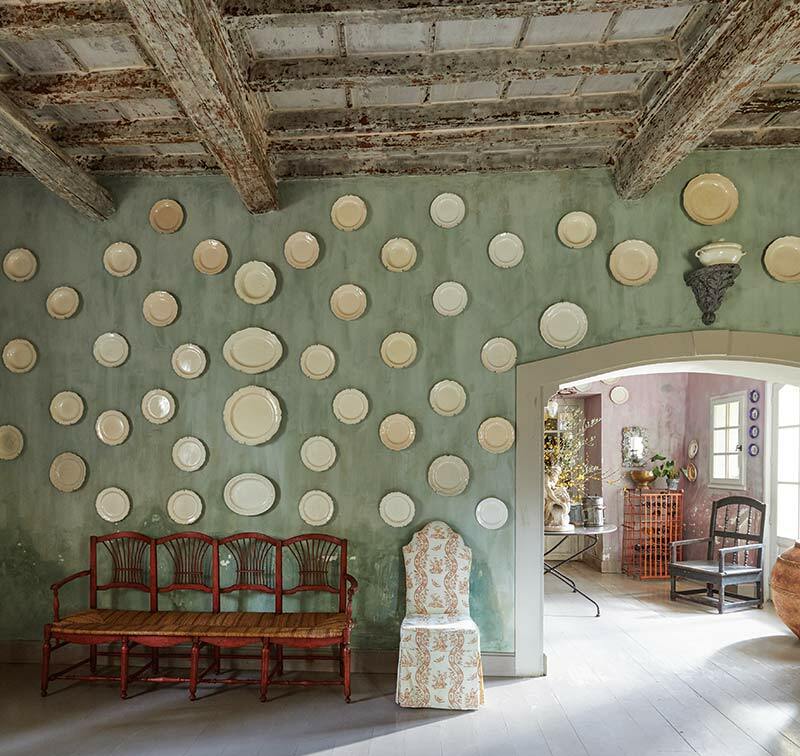 And delicate saucers make their debut at teatime or on beautiful wall arrangements. Treasures galore! Thank goodness so many beautiful antiques have been imported into the US so that we can acquire wonderful pieces and add eclectic flair to our homes! 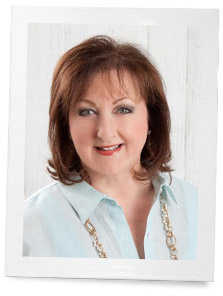 I adore anything beautiful, and I am always searching for ways to give items new life in my home. I am holding onto a vintage piece of blue-and-white linen from France that I just can’t quite decide what to do with. So, until I make up my mind, I’ll just keep admiring and refolding it, over and over again. 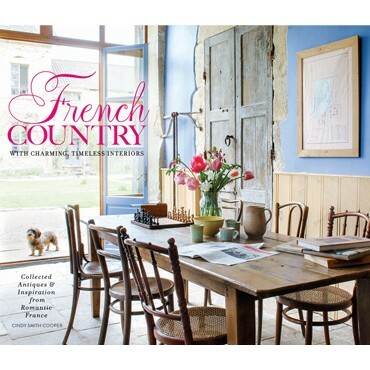 To pre-order your own copy of French Country, click the cover below! 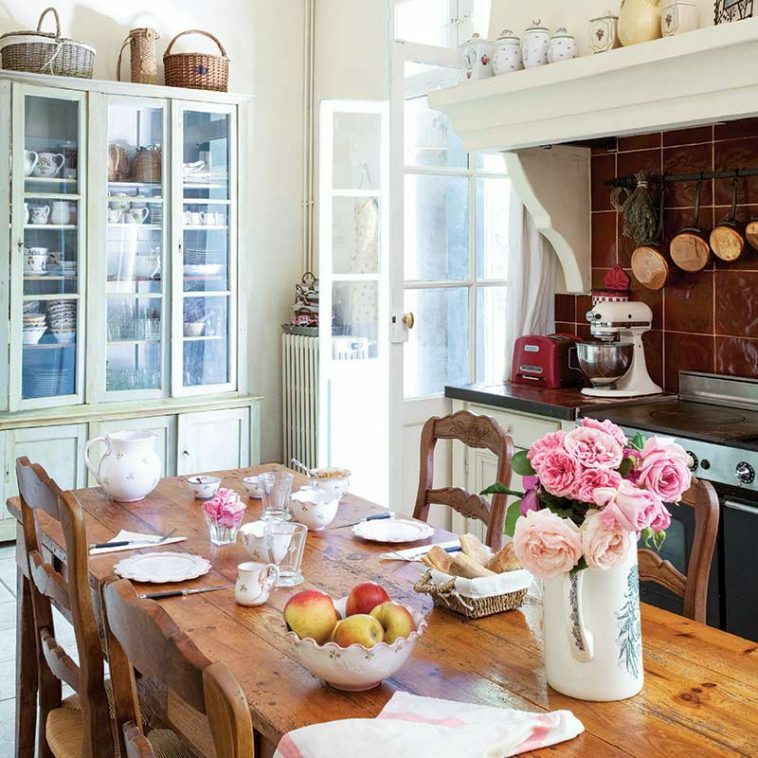 I love french country style. I use lots of it throughout my home. Toile fabrics are my favorite. Not sure the size of your piece of fabric, but it would be very pretty as a topper for a coordinating fabric on a small round table. April Cornell does big table cloths to the floor, then puts a smaller coordinating topper cloth over the big one and it looks very pretty. That would be lovely either in a bedroom or a breakfast room. Anything you plan will be a success. Soon to retire, hopefully, this would definitely be high on my Wish List! I’m sure you’ll have a waiting list in no time. Thank you again for painting a lovely picture with your words – – – you always do know how to put a smile on my face and in my heart! I would probably do a couple of toss pillows with coordinating blue velvet ribbon in two different styles to admire and share in conversation with family and friends……A gathering of “Ribbon Ladies” count me in! Have never traveled to your area of this great America and love the idea! A gathering of “Ribbon Ladies” … I like how that was worded. It sounds lovely. I imagine it would be wonderful and special gathering. I’m sure I would love to gather together. When and where will “Ribbon Tours” make her first debut ? Oh , I wish this to really happen ! Yes to the ribbon tours!! Maybe something in the United States to start things off would be wonderful!! I’d use the fabric for a chair so I could see it all the time. I’d keep the chair in my office. If there’s not enough, I’d probably make a pillow or table top. draped over the piano with a large vase of flowers. Trips sound like such a wonderful idea – count me in! How many would be interested in trips??? We could call them Ribbon Tours! WOW! I would certainly consider trips with a group of like-minded women.I have never been abroad and would not travel alone. This seems like a golden opportunity. Not sure how much of this material you have but maybe you could sew one big pillow or perhaps a couple of smaller pillows?? Perhaps use the fabric as a shawl for yourself or as a scarf/runner to drape over your piano top ? We are leaving on Aug. 28 for a Seine River Cruise. I’m so happy to have come across this article so I can keep an eye open for your beautifully described details! This was Kismet. Have you considered framing the linen? I dont know how big it is but it would be gorgeous I’m certain framed. Have you ever considered organizing tours/trips to the areas you have visited and loved ? No doubt , you would know where to go … places of the heart ❤️ in France , Italy , England , Ireland , Victoria ??! And not to forget , the beautiful spots here in our own beloved America .